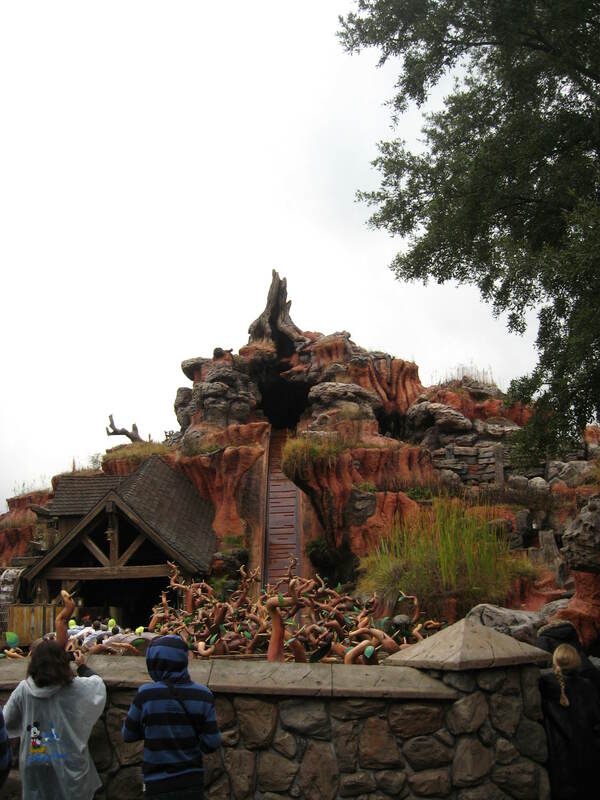 After the challenges with Hopkins at Disneyland, Walt Disney Imagineering designed a brand new ride system for the Magic Kingdom and Tokyo Disneyland Splash Mountain. The result was a high capacity comfortable flume attraction that uses large boats with 4 rows of two. The Disneyland boats were to feature at least 8 seats inline, but this was redesigned before opening to 7 and then later remodified to 6 inline seats. This is the current configuration at Disneyland. So after those issues, the design and fabrication was brought back in-house at Walt Disney Imagineering. Splash Mountain at the Magic Kingdom. The barn on the left is the second lift hill. The boats and various ride components were fabricated behind the Magic Kingdom at the Walt Disney World Central shops. One interesting aspect is that the Magic Kingdom Mountain boats had fixed grab bars while the Tokyo Mountain had a large lap bar per row to restrain riders when they opened. Both have different layouts with Tokyo having an indoor load and unload. It also features a larger show building, thus allowing vast show scenes and a mostly all indoor waiting line. Both opened within a day of each others in October 1992 to great success for both parks. Both rides features belts in the station, but continuous loading is not used. Instead, 3 to 4 boats are unloaded and loaded at once in Florida and in Tokyo, two boats unload, then go around a curve and then go to the loading dock, where two boats load. The entrance to Splash Mountain at Tokyo Disneyland. A restaurant with a view of the flume after the final drop was also constructed at the time. Grandma Sara’s Kitchen is part of the Splash Mountain complex at Tokyo Disneyland. As you can see, the style inside is the same as the attraction and the atmosphere quite cozy. It is also a high capacity facility with seating on two levels and the kitchen and order counters on the bottom floor. The Rackety Raccoon Saloon was was also built at the exit of the attraction and serves snacks and drinks. The launch for the Canoes was integrated in Critter Country at Tokyo Disneyland and renamed the Beaver Brothers Explorer Canoes. The outdoor layout in Tokyo is mirrored versus Florida. Also, the barn was replaced by a cave for the second lift hill on the right. A boat floating toward the second lift hill. The original Tokyo Disneyland/current Magic Kingdom lap bars. In January 2011, the Magic Kingdom Splash Mountain grab bars were replaced by the Tokyo lap bars. In late 2013/early 2014, the bars in Tokyo were replaced by individual U shaped bars and the minimum height restriction is an incredible 90 cm/35 inches at Tokyo Disneyland. Florida and California have a 40 inches height restriction. 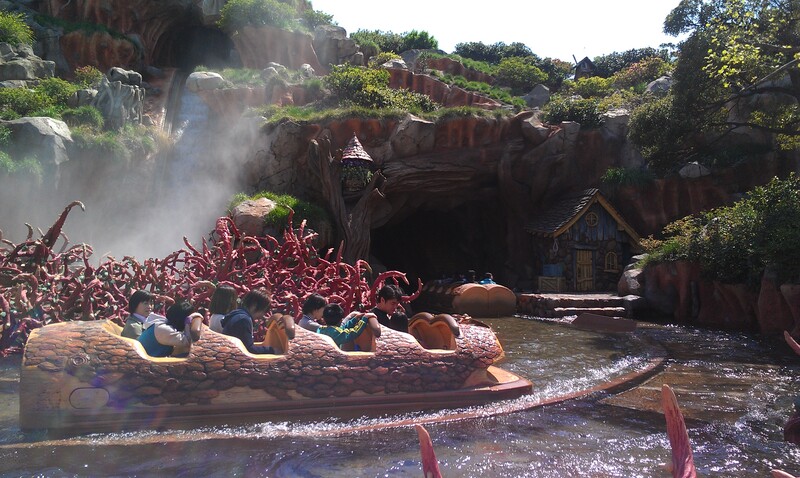 A look at the U-shaped lap bars and individual seats present on the logs at Splash Mountain at Tokyo Disneyland. Both attractions feature 4 drops, with the first one outdoor at Walt Disney World. The second drop is dry and has a small hill in the dark. The third one is right after and bring us to the bottom of the mountain. After the dramatic third lift hill (Two lifts are at the beginning of the ride), the boat plunge 52.5 feet at a 45 degrees angle outside. Tokyo features a standard rubber belt lift arrangement, but at the Magic Kingdom, double lift chains take the boats up the three lift hills. That is what Intamin later used to take boats up at Chiapas. 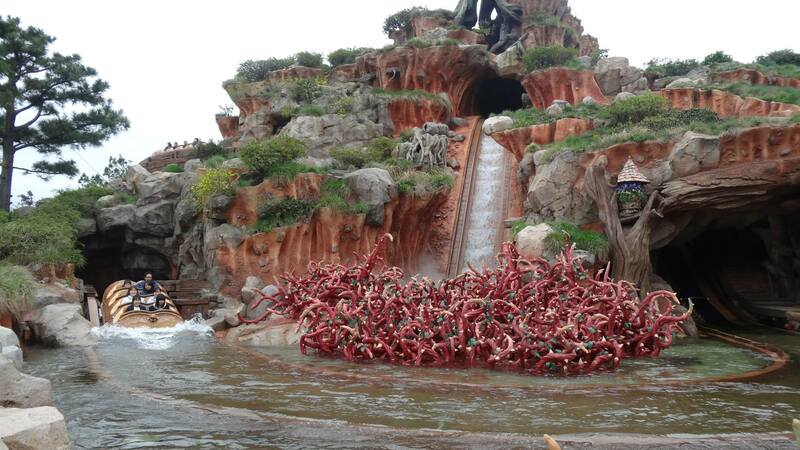 The second lift hill on Splash Mountain at the Magic Kingdom. You can see the two chains to the side of the falling water. This entry was posted in Water Ride and tagged Disney World, Disneyland, log flume, Magic Kingdom, Splash Mountain, Tokyo Disneyland, Walt Disney Imagineering. Bookmark the permalink.